For the bay in Erris, Co. Mayo, Ireland, see Broadhaven Bay. Broad Haven (Welsh translation: Aber Llydan) is a village and seaside resort in the south east corner of St Bride's Bay at the western terminus of the B4341 road in south Pembrokeshire, Wales. 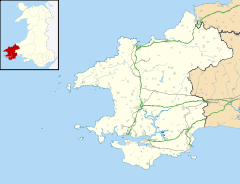 Broad Haven and Little Haven together form the Havens community and division of Pembrokeshire County Council. The 2001 census records a population of 1,328 for the Havens. The only church in Broad Haven is the Baptist church, although there are Anglican churches in nearby Little Haven. It is a seaside resort with a large west-facing Blue Flag beach  offering safe bathing for families and good surfing, windsurfing and sailing opportunities. The north end of Broad Haven beach has a number of interesting geological features including folding, a stack (locally known as Lion Rock) and natural arches. The town has a number of restaurants and pubs including The Galleon Inn and The Ocean. Broad Haven is not to be confused with Broad Haven South beach near Bosherston in south Pembrokeshire with the same name. Little is known of the origins of the village but it has been known as a seaside resort since the 1800s. A RNLI lifeboat was stationed at Little Haven from 1882 to 1921. In 1967 the station was reopened with an inshore lifeboat, with the name changed to Little and Broad Haven Lifeboat Station. On 4 February 1977, a yellow cigar-shaped craft is believed to have landed in a field next to Broadhaven Primary School. A group of 14 children playing football saw the craft and a silver creature. The headmaster, Ralph Llewellyn, asked the children to draw the craft and he was surprised how similar the drawings were. On 17 February 1977, the same craft was claimed to have been seen by some teachers at the school and by some dinner ladies, one of whom saw a creature make its way onto the craft. The owner of the Haven Fort Hotel in Little Haven claims to have seen an 'upside-down saucer' on 19 April 1977 in a neighbouring field with two humanoid creatures. Broad Haven was host to the Pembrokeshire Coast Triathlon from 1994-96 when the event doubled as either the Welsh Championships (1994) or a British Grand Prix event (1995 and 1996). ^ "Sunset View Restaurant | The Galleon Inn". the-galleon-inn.com. Retrieved 2018-05-19. ^ "Ocean Cafe Bar and Restaurant, Broad Haven's Seafront Venue, Menu". www.oceancafebarandrestaurant.co.uk. Retrieved 2018-05-19. ^ "Little and Broad Haven Lifeboat". Retrieved 16 June 2014. ^ "Archive: Dyfed Triangle UFO sighting from 1970s". BBC News. 12 July 2012. ^ Bourton, Tom (5 July 2007). "New details on UFO case revealed". BBC News. Retrieved 2009-10-29. Wikivoyage has a travel guide for Broad Haven. This page was last edited on 21 April 2019, at 04:29 (UTC).